Grand Falls on the St. John River in New Brunswick is one of the most spectacular waterfalls you will ever see despite the top several feet having been dammed to create a head pool for the hydroelectric project. The locals told me that if I put in below the power station I will not encounter any white water rapids. They say that it is so deep that the discharge from the power station combined with the water coming down the gorge is all buffered and results in several miles of deep fast-moving water with no rapids. I put in my kayak below the power station with confidence and excitement to now be transitioned into my kayak for the rest of my journey. I said so long to Nicole and headed down stream. I went around the first bend in the almost half-mile wide high flow river and encountered the first of dozens of rapids that I would encounter for the next 12 or so miles. So much for my local information gathering! Fortunately these rapids are easy to read and are class one and class two whitewater. Waves were up to 3 feet high and the water was very boily. I was on edge the entire way because the information I received was not correct and I did not know but what there could be significant rapids ahead. My top speed for this section of river was more than 20 mph and was a lot of fun to explore. We spent the next night in Perth-Andover. At breakfast at a bistro that next morning we met some of the locals who lived on the Indian reserve upstream. 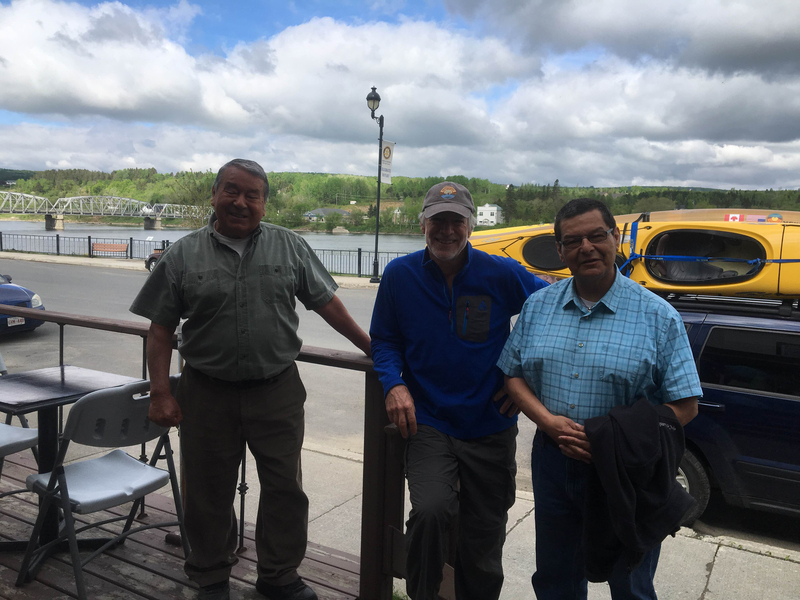 These Maliseet men were extremely engaging to speak with and very knowledgeable. They knew the river before the giant hydropower project was built. They told us about their people living on the salmon fishery and harvesting fiddleheads. They told us about an ecosystem and a way of life that no longer exists. It was clear that this saddened them. 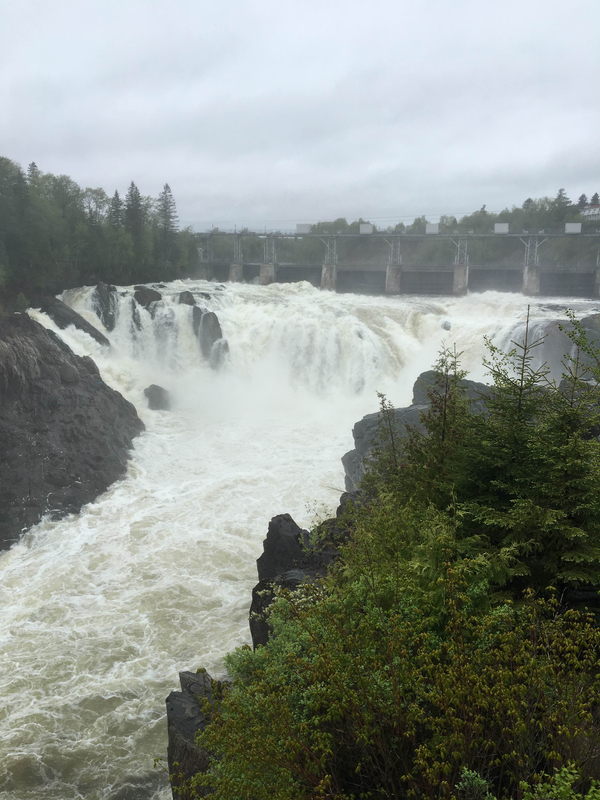 During our conversation I learned for the first time that a decision was going to be made soon about the future of the largest hydroelectric dam downstream at Mactaquac. There was the possibility that it might be removed which seemed to give them hope. 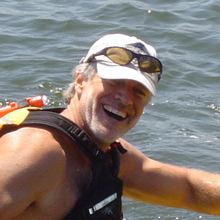 They related very closely with my PaddleQuest 1500 and traveling the ancient water trails by canoe and kayak. I received a blessing for which I was both humble and grateful. I feel that this bodes well for the rest of my journey. A few miles after Perth-Andover the river slows under the effects of the head pool for the next hydropower dam downstream at Beechwood. There is no accommodation for the traveling paddled at this dam. In fact it is not until the town of Bath four or five miles downstream that there is a way to even get down to the river with your boat. It is clear that this section of river immediately below the Beechwood dam is not utilized by paddlers due to the lack of access. My daily mileage with current in my favor tops 30 miles per day. I proceeded to the next town of Hartland and encountered a number of intermittent small rapids along the way. Still there was little evidence of development as I made my way to the town with the World’s Longest Covered Bridge. Every day on the St. John River I have seen several bale eagles. On one occasion with a stiff headwind coming up the river a bald eagle was heard just yards away from my kayak, and plucked a silvery fish from the water. It gave me chills to witness this, and to be so close. From Heartland to Meductic and to Bear Island all the way to Mactaquac, the St. John River is no longer a river. It is a reservoir and head pool for the Mactaquac Hydroelectric Dam. Along the way, I learned from locals about the towns, the villages, the farms, the cemeteries, and the way of life that is now buried in well over 100 feet of water. At the Big Axe Brewing Company we saw photographs of the way it used to be prior to the flooding. Speaking with locals about the possibility of dam removal, I learned that the opinions are mixed. The woman who owns Great Bear Island Campground (which is named for the now buried island where bears would congregate to feast on Atlantic salmon during the salmon run) said that they made the wrong decision in 1967 and 68 when they decided to build the dam but now to remove the dam may end up being another round of destruction to the way of life people have become accustomed to. I also spoke to other people who saw dam removal as a rare opportunity to write a wrong and to restore the river, the fishery, and the ecosystem to the way it should be. They also suggest that the restored river would provide brand new economic development opportunities currently not available. One thing is for sure, this is one complicated issue and there are no easy answers. At Great Bear Island Campground I awoke to frolicking river otters in front of my campsite. 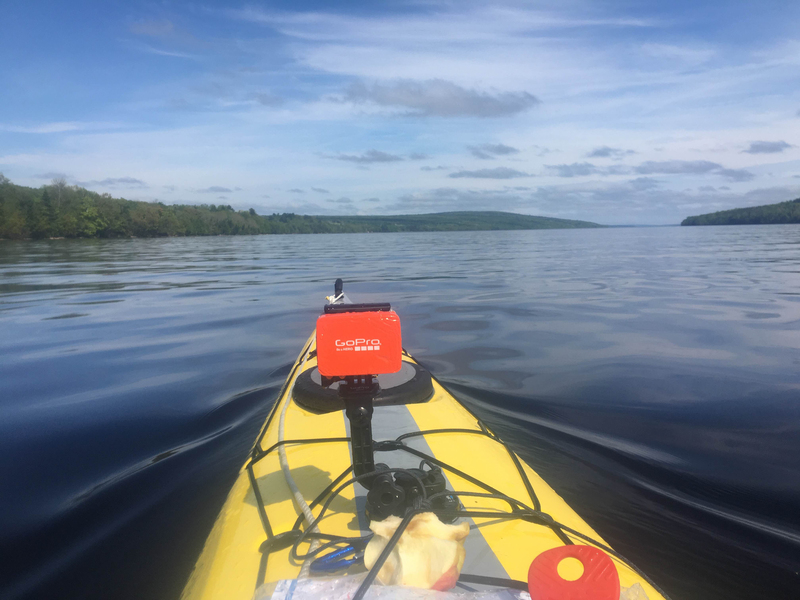 I made Adventurous Joe Coffee, had my Grandy Oats granola, loaded my kayak, and got an early start as the city of Fredericton, New Brunswick was my destination. My friend Dan Carr was meeting me there, and I was excited to see him. The next 15 miles of lake water was like glass and the sun was shining. I arrived at the Mactaquac Dam and it was not clear which side to portage around. I had information suggesting that the right side was best and I had information suggesting the left side was best. It was not clear to me that there was access at either end. I chose to portage around the right end of the dam, which required descending about a mile of gravel road from the head pool to the foot of this behemoth of a dam, and elevation change of a couple hundred feet. Once I was below the dam, I had several yards to carry my gear and kayak over rocks, sand, gravel and logs. Bald eagles were congregated in large numbers to fish what appeared to be shad. Watching them circle and dive to pluck these fish from the surface was fascinating. It is amazing to see nature in action and it was surreal to view this at the foot of an immense concrete barrier in this place. I ferried across the high flow discharge from the power station and realized that I was now on the tidal waters of the St. John River. From this point forward, my days will be dictated by the direction of tides and the moods of the waters I will encounter. This will truly be a very different kind of journey, beginning now. The next 12 or 13 miles to Fredericton went very quickly with an outgoing tide combined with the downstream flow from the dam. 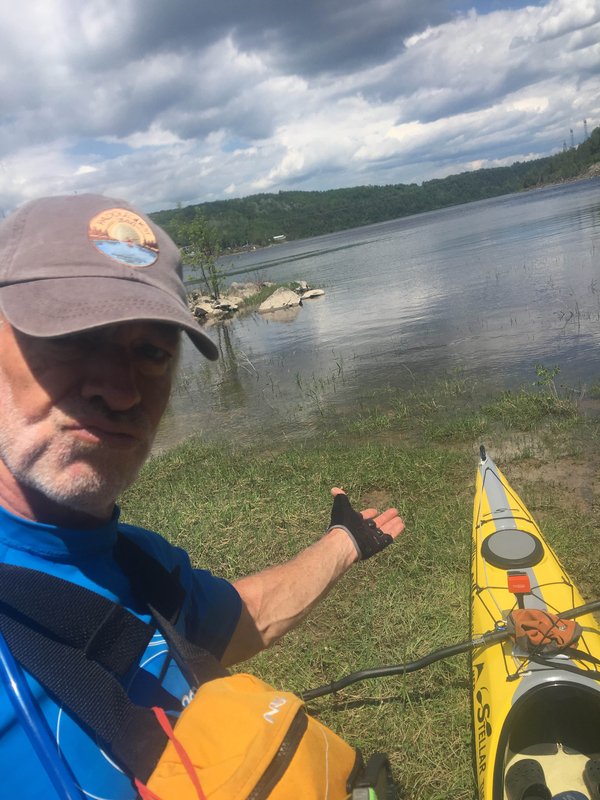 I continued to see bald eagles as I made my way to Fredericton, and at one point a sturgeon jumped out of the water and nearly hit my kayak. That was confirmation that I am in tidal waters. I arrived in Fredericton and landed on the shoreline about a block from where I would meet Dan. 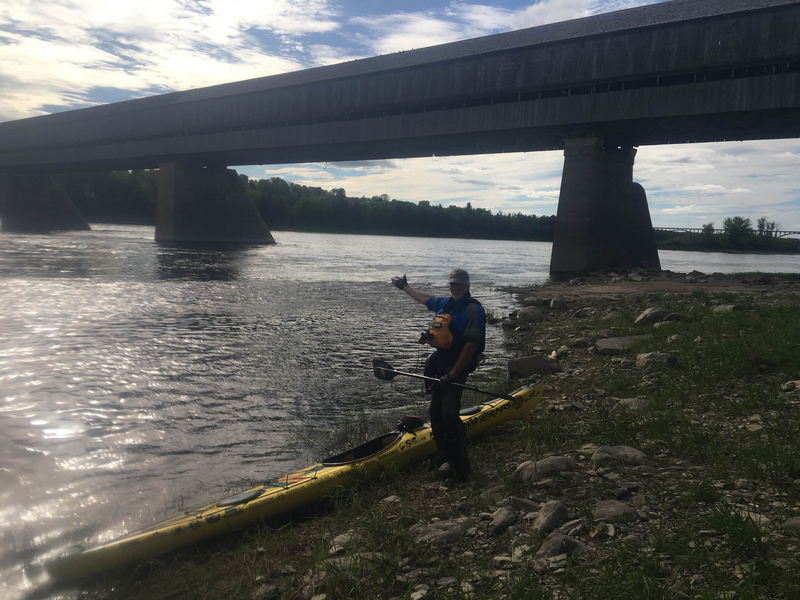 Joining Dan and me to paddle the mouth of the St. John River at the reversing falls and Bay of Fundy, will be my good friends who live in St. John, New Brunswick. We chatted on the phone about what the next couple of days would look like and when they would be able to join us to show us the way. Today, Dan and I will take the outgoing tide to a downstream town nearly 20 miles away. I am thinking of having my first layover day in a very long time before we continue down the river to the Bay of Fundy. Since I began on April 16 I have had two days off from my journey. One of those was a wonderful day in Newport, Vermont with Nicole. And the other day off I guided a high water dead river rafting trip in Maine. Something tells me that this upcoming layover day will not see me in a boat. I hope there is sunshine because my white legs have not seen the light of day in a very long time. My tan is not so good and I probably look best in the dark! Great read, loved the part about you meeting some Maliseet folks and the blessing you were given. My great grandmother was from Tobique. I have a netting salmon story from there to share but not in public forum. Have a great paddle!